DrTim’s Aquatics Bene-FISH-al™DIY fish food is a unique and healthy alternative to flakes and pellets. With no grains, filler and binders your fish get just plain nutrients without the bulk that only pollutes your tank and decreases your water quality. 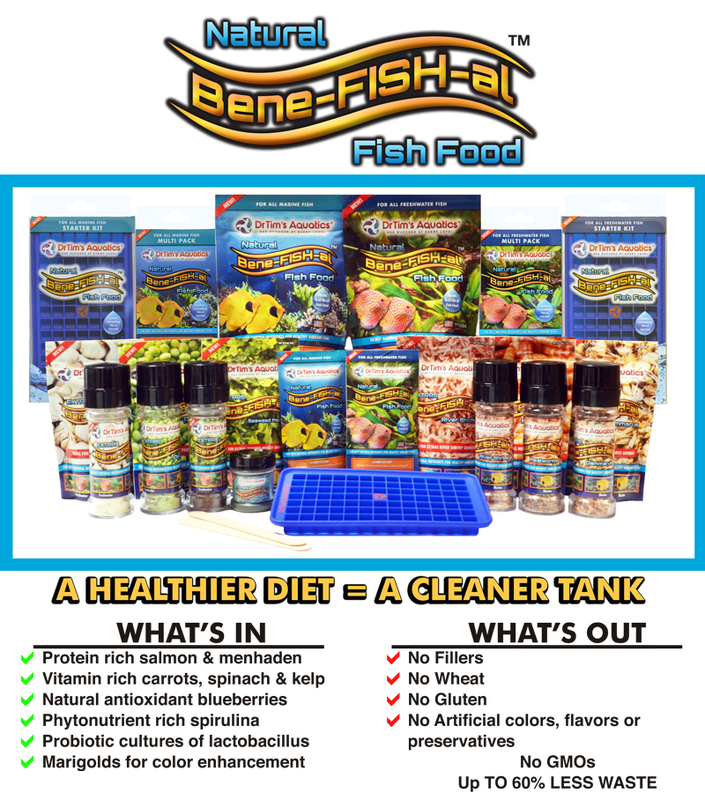 (Simi Valley, Calif.) DrTim’s Aquatics announces the release of their new Bene-FISH-al™ DIY fish food. A complete diet without fillers, grains, and gluten DrTim’s Aquatics Bene-FISH-al Fish Food is also GMO-free with no artificial colors, flavors or preservatives. DrTim’s Bene-FISH-al fish foods are a healthier diet that means a cleaner tank with up to 60% less waste produced and eliminates stringy poop and bloated fish. Made with protein-rich salmon and menhaden, vitamin rich carrots, spinach and kelp Bene-FISH-al™ Fish Food also contains blueberries for natural antioxidants, phytonutrient rich Spirulina and probiotic cultures of lactobacillus. Bene-FISH-al™ Fish Food pouches are nitrogen-flushed to maintain freshness and longer lasting quality and Made in the USA. “This new all natural fish food represents a great step forward for hobbyists because not only is it a healthier fish food but by using our selection of EXTRAS™ every hobbyist can tailor the food to the exact needs of their fish” commented Dr. Timothy Hovanec, CEO of DrTim’s Aquatics. Bene-FISH-al™ fish food is available in single use pouches to be used with DrTim’s silicone tray that makes 90 cubes, a convenient multi-pack containing five single-use pouches and an economy size (with scoop) that make 10 trays worth of fish food in both freshwater and marine formulas. A complete starter kits is available that includes the 90 cube tray, 2 single use pouches, stirrers, recipe card and freezer store bag. For more information on DrTim’s Aquatics Bene-FISH-al™ DIY fish food, visit www.drtimsaquatics.com. You can also download the DrTim’s Bene-FISH-al™ Fish Food Guide here.